“The function of the artist isn’t to copy life but to interpret it,” was the statement on the prominent poster on one of the art-filled walls of the recent, 3rd Annual San Clemente High School Art Show at the Casa Romantica. Ironically, March 31’s “coming out” party consisting of 200 artworks by 15 to 18-year-old San Clemente high schoolers was a “going away” celebration for long-term mentor, Rick Delanty, who penned the phrase. A highly regarded artist in his own right, Delanty is hanging up his teaching togs of 32 years to focus more diligently on his own painting. According to his students, he has more than met their fervent need for challenge, for charging their creative juices, for helping them to acquire self-motivation, and for their own conquering of self-expression. Here is a teacher who doesn’t have to rely on quizzes and tests with multiple choice questions and memorization. Delanty is an igniter of minds, a pusher of the envelope, an empowerer who shares his love of art with apprentices beginning a similar romance. This two-week exhibition of student work enhancing the walls of the Casa personified what a career teacher can inspire in his students. It’s a worthy tribute to a pied piper whose talented followers will carry on the banner he has waved so long. His reward is their self-motivation; their individual creativity; the expressing of themselves far out of boxes, rules, regulations and mental restrictions. With them, he has pursued the continuing expansion of their minds and imaginations, their interpretations of life itself. The student efforts shown represented a variety of art media: oil and acrylic paintings, ink drawings, pencil renderings, ceramic artworks, photography, portraits in pastel, watercolor paintings, mixed-media abstractions, digital creations, thematic series, geometric designs, and life drawings. The viewer senses that the works of these artistic inventors will someday hang in renowned art galleries. The vigor, the color, the grotesque along with the beautiful, the vibrancy of youth can be felt when you walk through the Casa. Seascapes, townscapes, still lives, portraits, abstractions, cups, vases, ashtrays, figurines and photographs well represent the student’s collective and inventive output. Soon-to-be retiree, Delanty, is proud that the same artistic spirit will continue after he’s departed, and he has strong feelings that his replacement will capably fill the huge shoes he’s leaving behind. Recently arrived Casa Romantica director John Longren admitted amazement at the talent the youthful exhibitors evidenced. While Delanty was reluctant to rank his students, several are already widely recognized as coming attractions. Senior Joey Varholic has enjoyed considerable success in his versatile expression in oils, watercolors and his variety of subjects and flights of fancy. He’s already painting commissioned pictures for local art lovers. Joey’s striking, serious self-portrait was used in the promotion of the student exhibition; he also displays his flexibility with three attractive landscapes, an impressionistic “Blue Moon” crucifixion scene, a surrealistic city modeled by his own imagination, and even a black and white picture contrasting a skull, a boot and a snake. Student artist Liz Amorosia is another mixed media advocate, with her personal interpretation of a young person’s immediate environment, the stages of life with paintings of three different life periods – infant, young woman, older bearded man; a piece painted with nail polish on canvas; and works showing the differences between shapes and tones. Kathryn Hoist’s striking efforts demonstrated expressive designs and personal interpretation in four images of rough sketches becoming finished black and white products, and her drawings from life, as well as her distorted portraits. What do his former students think of Delanty? Rick Delanty’s paintings and prints are distributed through Delanty Fine Arts and Greg Young Publishers in Santa Barbara. 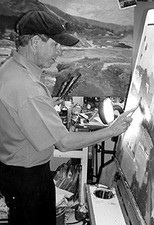 His work can be viewed on his website www.delantyfinearts.com. His 10th Art Show will take place at his home.